Egg Kurma is a delicious, tasty and easy to make dish that goes well with rice, rotis or idiyappam. 2. Saute the ginger, garlic, small onions, cinnamon, cloves, coriander seeds, roasted gram, green chillies, peppercorns, cumin seeds, saunf and coconut for a minute. 3. Remove and grind together to a fine paste. 4. Heat the remaining oil in the pan. 5. Fry the mustard seeds and urad dal for 30 seconds. 6. Saute the onions, tomatoes and curry leaves for 2 to 3 minutes. 9. Pour 2 cups of water and bring to a boil. 10. When it starts to thicken, add the eggs and cook for 2 minutes. 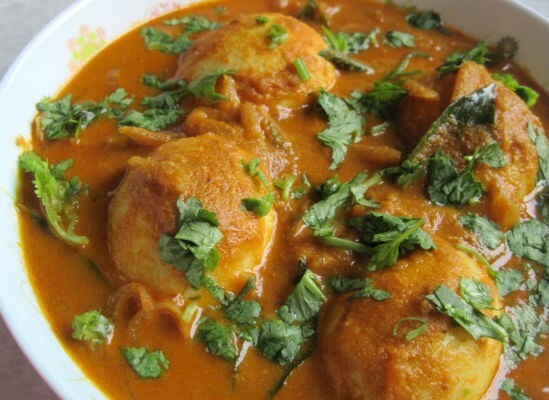 Feel free to comment or share your thoughts on this Egg Kurma Recipe from Awesome Cuisine.